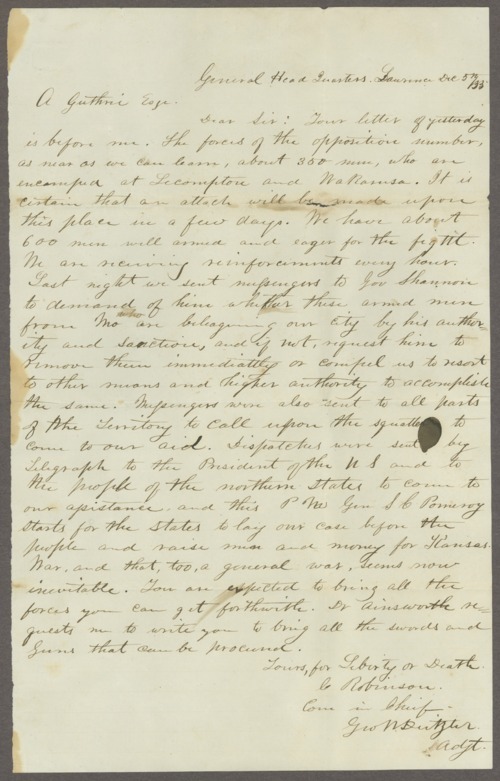 A letter written by Charles Robinson and George W. Deitzler to A. Guthrie asking for help in defending Kansas Territory from Missouri insurgents. He tells Guthrie that 350 armed men from Missouri are encamped at Lecompton and Wakarusa. Robinson states that he has sent messages to all parts of the territory, the northern states and the President of the United States asking for assistance. He writes that war is inevitable. A searchable, full-text version of this letter is available by clicking "Text Version" below.